Samsung has made new compact model and special for internet printer version with one touch print screen captured function. You can get it with cheap price and suitable for family and small office use only. 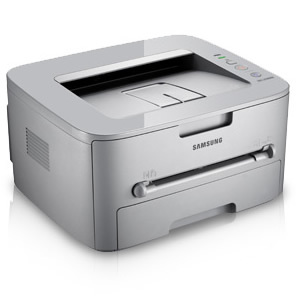 Samsung ML-1660 can print up to 1500 pages with starter cartridge. But you must to buy new cartridge when starter cartridge is out. I think nobody want to buy new when drum cartridge is still new and bright. So we can refill it, but you will get headache to reset counter for Samsung ML-1660/1665/1666. There are many ways to reset it by software and hardware. Here we show you some version of reset tools. – Do it with your own risk, think twice before start to use it. – Although Samsung ML-1860/1865 is the same product line to 1660/1665, but we have not tested with this firmware, please take care before re-programming. How can i roll back the changes made by resetting the printer counter with a wrong version fix ??? The printer is in a un-detectable state(By the computer). Please help me..
With flash new firmware for Samsung Printer, you can flash many time by push it to flashing firmware status by press and hold cancel button when power on your printer (continuous flashing light) and that’s time you can drap and drop rom file to flashing tool. Try to turn off and wait for 10 mins and turn on again, your printer can breath again. Good luck! Normally, if you re-flash your firmware before counter reach to limited value (maybe 500 pages is the best), you will be success with high capability. If you re-flash when red light up, you will have to use other way to reset. You can not use this tool to reset counter, I have this tool, but it can not be used by everyone, it need some knowledge base about electronic and not for end user. exist an fix tool for it??? Did you try v30 firmware? I think you can download v30 (2nd download link) and just do as guide steps. Hello resetcounter, Please post firmware for scx 3201 printer. the counter page is 1570 and red light is up. now how do i reset counter? When I run the file, the printer lights are blinking. This continues for infinite time. In this mode after some minutes the temperature rises sharply. You can disconnect power cord to your printer, wait for 5-10s, connect power again and power on your printer. – Do step by step as upper post. I have tried this fix for my ML-1660, firmware version V1.20.0030f, but it did not work. Now my printer is stuck with a solid red light, and my computer cannot recognise it. It also makes a strange noise when I switch it on and I am afraid of it overheating. All links have been updated! Thanks for report broken links! All link doesn’t work. Could you please update again all above link? Please check again, all link work fine with me. i applied the “Samsung ML-1660/1665/1666 Firmware V01.00.30” in my Sansung ML-1666 using windows 7. After doing this my Sansung does not work. i can not able to recognize my computer printer USB port. On the other hand, i observed that printer both LED light is in on condition (LED light are shining). I push both LED several time but it’s not response. Please advice, if you have any way to solve this problem. thank you reset counter, now my printer is destroyed. I should have availed of a professional printer reset shop, now my cost is twice now. I’m very sorry about your printer. But it’s hard to damage to your printer as you said “destroyed”. i applied the “Samsung ML-1660/1665/1666 Firmware V01.00.34″ in my Sansung ML-1666 using windows 7. After doing this printer is not able to recognize my computer USB port. On the other hand, i observed that on printer both LED light is in on condition (LED light are shining). I push both LED several time but it’s not response. Also If i replace with new cartridge, will it work. I mean with the software you provided are the changes done to printer or cartridge?